*It's been a rough year so far for the smooth jazz format, with prominent defections in large markets such as New York and Washington, DC. Last Friday, the trend came to eastern PENNSYLVANIA, as Greater Media pulled the plug on smooth jazz at WJJZ (97.5 Burlington NJ). This was the second incarnation of the format in the Philadelphia market - back in August 2006, Clear Channel changed formats at the original smooth jazz WJJZ (106.1 Philadelphia, now WISX), and in November, Greater Media picked up the format and the calls on 97.5, which was in the process of moving into the market from its longtime home in Trenton, N.J.
As the format faded out at 6 PM Friday (Sept. 5), it was replaced by a weekend of stunting that promised something "new" and "now" for the Philadelphia market. "Now" arrived at 9 o'clock Monday morning, when WJJZ exited its stunt with the now-ubiqitous "Don't Stop Believing," then launched into a brief, selective recap of the history of Philadelphia radio before announcing a "new" approach to adult contemporary radio under the moniker "Now 97.5," with a new website at nowismusic.com. 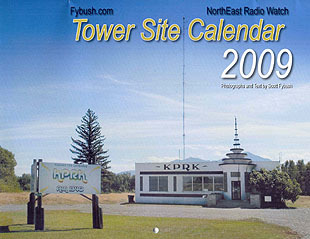 Tower Site Calendar 2009 is now shipping! 14 great full-color images of famous (and some not-so-famous) sites everywhere from Schenectady to Salt Lake City, plus important dates in radio and TV history. *Elsewhere in the Keystone State, WPTT (1360 McKeesport) flipped to business talk last Monday (Sept. 2), becoming WMNY, "Money Talk 1360." Programming is mostly syndicated, but next Monday will bring the launch of "Pittsburgh Renaissance Radio," to be heard weekday afternoons from 3-6. Fred Honsberger returns to the afternoon airwaves at KDKA (1020 Pittsburgh) today, almost three months after a broken shoulder took him off the air. Honz will be broadcasting from his home studio for now, while he continues recuperating. In Bedford, WUFR (91.1) signed on August 16, with its religious programming coming via satellite from Family Stations' Oakland, California studios. *In Albany, NEW YORK, Jeff Lyons has returned to WAJZ (96.3 Voorheesville) to co-host the morning show with Big Ray and serve as music director. Lyons left Albany Broadcasting in 2005 to work at Cumulus' cluster down in Tallahassee, Florida. Over at Regent's Albany cluster, Glen Stacey has exited the PD/afternoon drive chair at WBZZ (105.7 Malta) in a move being blamed on budget cuts. Jake Thomas, who does afternoons at sister WGNA (107.7 Albany), will take on Stacey's duties. In Syracuse, Ty is departing Galaxy Communications, where she was acting PD at the "K-Rock" simulcast (WKRL 100.9 North Syracuse/WKRH 106.5 Minetto/WKLL 94.9 Frankfort). The upstate native is heading to Baltimore, where she'll start a week from today as APD/music director and middays at Clear Channel's WCHH (104.3). It looks as though Dave Radigan's WEBO (1330 Owego) will be the next member of the "FM translators for AM stations" club - he's paying $5,000 to buy W300BV (107.9 Waverly) from Daniel Peltz. In another translator sale, Bud Williamson's Digital Radio Broadcasting is paying Clear Channel $4,000 for W255BX (98.9 Hudson), which currently relays WCTW (98.5 Catskill). We spent much of the weekend watching the vintage race cars circle the track at Watkins Glen, and checking out some changes on the region's radio dial, too. Just up the road in Dundee, WFLR (1570) has indeed dropped the Geneva-based "Finger Lakes News Network" simulcast. It's now carrying the country format from sister station WFLR-FM (95.9 Dundee), and promoting WFLR's upcoming "move to 96.9." As we've noted previously, this is actually all about WFLR-FM's construction permit to move to 95.5 in Odessa, which will make it an Ithaca-market station; the country format for Dundee and Penn Yan will live on at 1570 and its new FM translator, W245BL (96.9 Dundee). For now, there's a three-way simulcast on 1570, 95.9 and 96.9. Watkins Glen's own station, WRCE (1490), made for interesting listening over the weekend. While it's nominally a simulcast of Backyard Broadcasting's country "Pig" WPGI (100.9 Horseheads), we heard at least three other program streams on the AM signal - a talk simulcast from Backyard's WWLZ (820 Horseheads), an IndyCar race from California and many hours of simulcasts of the track announcements from the Glen. There's another signal coming to Watkins Glen, too - Ithaca Community Broadcasting has been granted a construction permit for 91.9 there, with 1.3 kW DA/108'. *As Vox Radio Group settles in at the former Clear Channel stations in VERMONT, it's making some format tweaks. Gone is ABC's "True Oldies Channel" from WVTK (92.1 Port Henry NY), replaced by an AC format aimed at Addison County, the area around Middlebury that's lost most of its own signals to Burlington rimshot status. *Across the river in NEW HAMPSHIRE, Vinikoor got some bad news from the FCC about his construction permit for WQTH (720 Claremont). The WQTH CP officially expired unbuilt on June 13, 2007, but Vinikoor appealed, arguing that he lost valuable time while the Commission considered his application to move WQTH from its original city of license, Hanover, down to Claremont, and that New Hampshire's bad winter weather should allow him more time to construct a complex AM array. The FCC rejected the appeal, saying Vinikoor made a business decision to relocate WQTH while the construction permit clock ran down - and that the evidence suggested that Vinikoor didn't "diligently" pursue construction of the station. Over in Concord, WWHK (102.3) has been on and off the air for the last couple of weeks, spending some time with an automated classical format. We're hearing that caused some consternation for Concord's existing classical station, low-power WCNH-LP (94.7). Blueberry Broadcasting's WABI (910 Bangor) and WWBX (97.1 Bangor) dropped their talk and top-40 formats, respectively, in favor of the Boston-based WEEI sports network. Mark down new calls "WAEI" for the 97.1 facility. And the two signals Blueberry couldn't keep when it bought Clear Channel's Bangor cluster are now simulcasting. WFZX (101.7 Searsport) has dropped its modern rock format and flipped to oldies in parallel to WGUY (102.1 Dexter). *In NEW JERSEY, the Labor Day weekend brought lots of vacationers to the shore - and two format changes, too. WILW (94.3 Avalon) picked up the Don Imus morning show, which is being dropped as WTAA (1490 Pleasantville) moves away from progressive talk and flips to a Spanish-language format. NJN Public Radio has signed on a new signal. WNJO (90.3 Toms River) debuted August 23 as the latest link in the growing statewide network, which programs NPR news/talk and nighttime jazz. *CANADA's capital city is getting two new FM stations. The CRTC considered ten applications for new stations on 99.7, 101.7 and 101.9 and awarded new stations to Astral Media and Frank Torres. Astral owns CKQB (106.9 the Bear) in Ottawa, and will now add a 45 kW signal on 99.7 with a "comfort radio" soft AC format. Torres, meanwhile, will get 1.3 kW on 101.9 for a blues-formatted station to be known as "101.9 Dawg FM." That grant came over the objections of one CRTC commissioner: Michel Mathieu complained that Ottawa's existing talk-formatted stations, CTV's CFRA (580) and the CBC's CBO (91.5), enjoy a disproportionate share of the audience; Michel argued that the CRTC should have granted a license to Corus for a news-talk station instead. Speaking of CKQB, it's making some personnel changes: Shadoe Davis is out as morning man, replaced by Cub Carson and Katherine Dines. In Toronto, Astral Media flipped CKFM (99.9) on August 25, ditching "Mix 99.9" for the first appearance of "Virgin Radio" in North America. The top-40 format is taking aim at CHUM-FM (104.5) - but if Virgin's DJs are looking out the window at St. Clair and Yonge, they won't see the "CHUM" sign down the street any longer. We're told the iconic neon sign came down from the building at 1331 Yonge Street last Thursday; it will eventually reappear at CHUM's new home downtown. Classic country is history at Astral's CHAM (820 Hamilton) - as of Sept. 2 at 8:20 AM, the station has flipped to "Talk 820," with a lineup that includes Jason Farr and Jodi Gaskell in mornings, Mike Naburs from 9-noon and Dave Shuttleworth from 3-6 PM. The move creates new competition for Corus' CHML (900 Hamilton), and leaves oldies CKOC (1150) as the last Hamilton AM with music. One more southern Ontario format change: CIXL (91.7 Welland) is still "Giant FM," but it has transitioned from adult hits to classic rock. Back to Toronto for a moment: CFRB (1010) has reactivated its shortwave transmitter after a long absence. CFRX (6070 kHz) has become something of a hobby project for CFRB's engineers, we hear, and it was off the air for several years after its transmitter broke. We're hoping this return to the air is a permanent one. In Montreal, CJLO (1690) is now on the air testing; the Concordia University station hopes to be on the air for real within a few weeks. And we remember Ed Buterbaugh, the legendary engineer best known for the sound he crafted at CKLW (800 Windsor) during a 13-year run through the glory years of "The Big 8" in the seventies and eighties. Before that, Buterbaugh worked at WEAM (1390 Arlington VA/Washington DC) - and at New York's WABC (770); he'd later rejoin the ABC family at Detroit's WJR, where he retired a few years back. Some sad news from MASSACHUSETTS just as we go to press early this Monday morning: Paul Sullivan, the former WBZ (1030) evening talk host, lost his battle with brain cancer Sunday night. Sullivan's fight took a turn for the worse last week, when WBZ released a statement from his family saying that Sullivan was taken off medical treatment and was receiving hospice care at Saints Memorial Medical Center in Lowell. "Paul is surrounded by his family and friends and would like everyone to know how important all the thoughts and prayers have been to him," said the statement. That was Thursday, and now comes the word that Sullivan died with his beloved family by his side on Sunday evening, just ten weeks after he said farewell to his listeners in an emotional final show from the WBZ studios June 28. Sullivan, 50, was a true Bay State original, a newspaper guy who came late to the radio medium, adding WLLH (1400 Lowell) to his career at the Lowell Sun in the late eighties. Sullivan began filling in for the late David Brudnoy on WBZ in the late nineties, and took over the evening shift after Brudnoy's death in 2004, replacing Brudnoy's nightly academic seminars with an earthier (and distinctively Merrimack Valley-accented) approach to talk radio. It wasn't long afterward that Sullivan's brain cancer was diagnosed, and once again the WBZ family is mourning a good friend and talented broadcaster, lost far too young. Elsewhere on the FM dial, WXKS-FM (107.9 Medford) said farewell to its longtime home at 99 Revere Beach Parkway. Boston Radio Watch reports that "Kiss 108" signed on from its new digs across the street at 10 Cabot Road, shared with sister station WJMN (94.5 Boston), on Monday, August 27. WXKS (1430 Everett) will move its studios over to the new facility soon as well - but not with PD and morning man Raffy Contigo, who's moved on to Houston's KLOL (101.1). Afternoon jock Jose Miguel Espinal takes the PD chair at "Mega 1200/1430," reports BRW. We knew the newly-freed Buddy Cianci was returning to the RHODE ISLAND airwaves on Citadel's WPRO (630 Providence) - but we didn't know, until now, how many changes Cianci's return would bring to the schedule, not only at WPRO but across town at Clear Channel's WHJJ (920 Providence). Clear Channel, which syndicates Rush Limbaugh through its Premiere Radio Networks division, is bringing the Rush show in-house in Providence, moving him from WPRO to the noon-3 slot on WHJJ, effective next Monday. It's still not clear whether Limbaugh's move to WHJJ means the end of the local Helen Glover show, which has been occupying that slot as WHJJ's only local entry - but it is clear that some big shuffles are in the works on the WPRO lineup. Mornings on WPRO will be the province of John DePetro, who'll yield his mid-morning slot to Cianci and former morning man Ron St. Pierre. They'll be on the air from 10 AM until 2 PM, followed by an expanded Dan Yorke show from 2-6. It's been a busy week at the biggest oldies station in MASSACHUSETTS. First, WODS (103.3 Boston) parted ways with morning man Paul Perry after not quite five years - and then the Infinity-owned station began running spots that sound for all the world like political ads. Rather than promoting "Howard Dean for America," though, these ads tout "Dale Dorman for Oldies 103," complete with the rushed announcement at the end, "Paid for by Dale Dorman for Oldies 103, Dale Dorman, treasurer." We'll start with MAINE and Guy Gannett for a second week - and this time it's broadcast-related, as the company sells its television stations to Sinclair for $310 million in cash. In the region, Sinclair gets CBS affiliate WGME-TV (Channel 13) Portland, ABC affiliate WGGB (Channel 40) Springfield MA, and ABC affiliate WOKR (Channel 13) Rochester -- but because Sinclair already owns a TV station in Rochester, Fox affiliate WUHF-TV (Channel 31), it's turning around and selling WOKR, and not to Sinclair's partner company Glencairn Broadcasting, either. Instead, WOKR will be spun off to the Ackerley Broadcast Group of Seattle, which is building quite a cluster of ABC affiliates in upstate New York, including Syracuse's WIXT (Channel 9), Binghamton's WIVT (Channel 34), and an LMA with Utica's WUTR (Channel 20). Published reports in Portland say WGME's staff is nervous about the sale, since Sinclair's David Smith has a reputation for cost-cutting. At WOKR, the reaction is more that of relief, since Ackerley's reputation in the region is a good one, and the alliance will give WOKR access to WIXT's satellite truck and other toys. Digital TV in the Pine Tree State: WPXT (Channel 51) and WPME (Channel 35) have applied for DTV construction permits, on channels 4 and 28, respectively. In NEW YORK, the long-testing WYUL (94.7 Chateaugay) may finally be coming to life for real. It's been heard testing with hits and liners saying "Cornwall, get ready to say Yes" -- with the logical conclusion being that a simulcast of co-owned satellite CHR WYSX (98.7 Ogdensburg) is in the works. WYSX targets the cross-border Brockville market; WYUL now seems to be aiming a bit closer within Canada, at Cornwall instead of more distant Montreal. While we're up north, we'll note that Ottawa's CJBZ (1200) dumped the hits for sports on Tuesday, becoming "OSR 1200," with new calls possibly on the way. We'll also 'fess up to getting our Canadian mega-groups mixed up. It's Rogers, not Shaw, that's buying CHEZ, CFMO, and CJET in Ottawa and Smiths Falls. Rochester public radio WXXI (1370) has a new news director. He's Flower City native Peter Iglinski, formerly with WSKG (89.3) Binghamton.